Educational, intercultural exchanges between Pierce students and their peers from schools abroad are a basic characteristic of the School’s philosophy and contribute to our students’ educational experience. Our students travel to other countries, are offered accommodation by the families of the host school’s students, get to know new places and, for a few days, experience other ways of life. 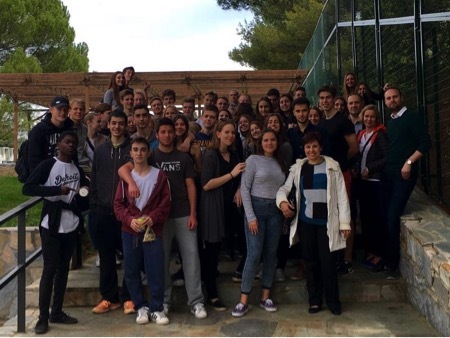 Then, the same students host peers from schools abroad in their homes, they show them around Greece and give true meaning to the word ‘friendship.’ Together, the participants share an interesting and enjoyable experience. A delegation of students from the Copenhagen Open High School of Denmark visited the Pierce IB DP on March 28, 2019, got to know our students and toured the school’s facilities. 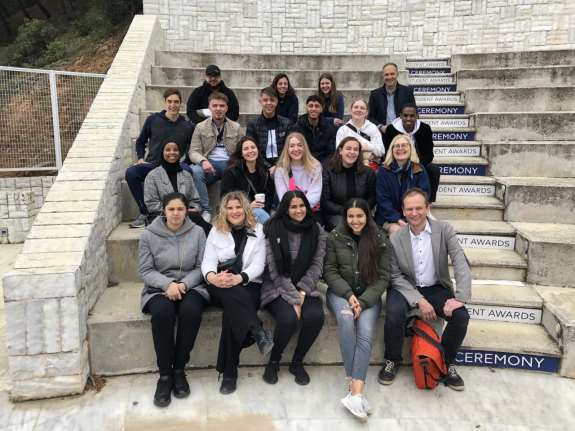 The 15 students (aged 17 to 19) and the 2 teacher-escorts were welcomed by IB1 students of the 15-member Student Council, along with a group of students from a Modern Greek class, who were also their hosts. In a classroom in the IB DP wing, they all attended and participated in a Modern Greek Literature class, taught in the English language by Teachers Ms. E. Kantzia and Ms. M. Lady. The students conversed, took photographs, exchanged experiences and social networking accounts and walked around the campus (classrooms, labs, playing fields). Student delegations from the St. Catherine’s School from Virginia in the United States of America and the Koege School of Denmark visited Pierce on March 2nd and 7th, 2017, respectively, got to know our students and were offered a guided tour of our campus. The 18 students from the USA and the 25 from Denmark (aged 17 and 18) and their accompanying teachers were welcomed by the students of G6 Gymnasium, Α6 and GO3 Lyceum, who were also their hosts. In the Pierce Amphitheater, the students from the USA attended a Mathematics class in the English language, which is included in the syllabus in both countries for the senior year of high school. The students from Denmark attended a Biology class in the English language, which is also included in the syllabus of both countries in the 12th Grade. The youngsters talked, took photographs, exchanged experiences and social networking accounts and walked together around the campus (classrooms, labs, sports areas). Then, the students from Denmark and American, accompanied by two Ambassadors, were shown around Deree and had lunch with a group of students there. On March 9, a delegation of students and teachers from the Slagelse Gymnasium of Denmark visited the College, met our students and were shown around the campus. 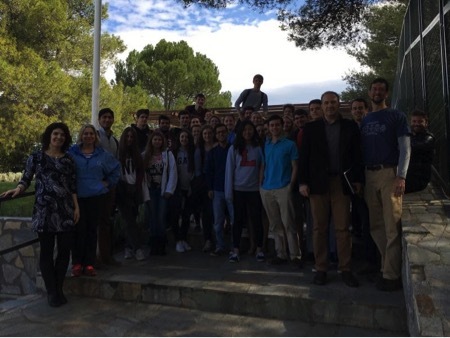 The 27 students (aged 17 to 18) and their 2 escorting teachers were received by students of Β4 Lyceum, along with their faculty advisor Mr. Michailidis and teacher Ms. Mavrikou, who were their hosts. The students talked, took photographs, exchanged experiences and social networking accounts, walked around the College campus (classrooms, labs, playing fields) and played a little football, all together. Finally, with the assistance of the Deree Ambassadors, they were shown around Deree, met up and talked with a group of Deree students, who also offered a meal in their honor. On March 10, a delegation of students and teachers from the Lawrenceville School of the United States visited the College, met up with students and were shown around the Campus. 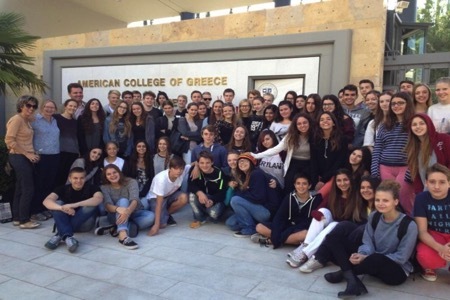 The 13 students (aged 17 to 18) and their 3 escorting teachers were received by the students of Β5 Lyceum, along with their faculty advisor Mr. Stamateris, who were their hosts. First they attended all together a class in Euclidean Geometry (at their request) in the College Amphitheater, by Mathematics teacher Ms. Kanta, entitled “Generalization of the Pythagorean Theorem.” The interaction among the students as well as the teachers demonstrated the beauty of the global language of Mathematics, offered new experiences to all and opened up areas of concern and cooperation. Then, the students talked, took photographs, exchanged social networking accounts and walked around the College campus (classrooms, labs, playing fields). Finally, with the assistance of the Deree Ambassadors, they were shown around Deree, met and talked with a group of Deree students, who also offered a meal in their honor. 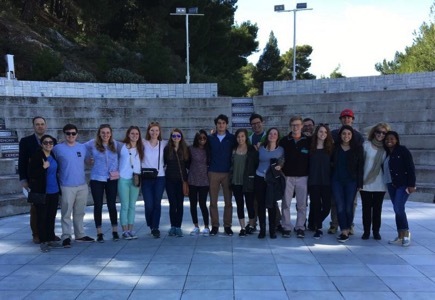 A group of students and teachers from the Academy of Visual Arts of Bergen County in New York visited Pierce and, along with students from our School, “brought to life” moments in the history of the Acropolis and its sculptures, as well as the Great Panathenaia on the stage of the Pierce Theater, offering a wonderful lesson in aesthetics and philosophy of art in Ancient Greece. For more on this visit, please see this link. In another of our students’ intercultural contacts with teenagers around the world, students of a Pierce g’ Gymnasium English class, in the context of their classwork, communicated by Skype with their peers at the school Bergen County Academies of Hackensack, New Jersey in the USA. For more on this activity, please see this link.